The sailing portion of the fall season has come to a close after this weekend’s Atlantic Coast Championships hosted by the College of Charleston. Bringing together the top teams from each of the three Atlantic coast conferences (NEISA, MAISA, and SAISA), the event put us up against the toughest competition that we faced this fall. Charleston is the farthest we have gone for a regatta this semester, so we decided to leave on Thursday night and stay over with the Hardings in Annapolis before doing the final 8 hours on Friday. Despite the distance, a good time was had by all, and we arrived in Charleston in time to have dinner and get to sleep early. After a good night of sleep and a nutritious breakfast, we were among the first teams to arrive at the marina on Saturday morning. This gave the team, which consisted of myself, Meaghan Harding, Catie Hopkins, Cary Kane, Patricia Andrade, and Jack Swikart, plenty of time to rig boats and get our minds into race mode. Promptly after the 9:15 skipper’s meeting, both fleets were sent out to Crab Bank to drift around until the breeze filled in. After a one hour delay, the first A division race was started at about 11 o’clock with Jack and Pati starting out the day in the 4-7 knot shifty easterly that held until the end of Saturday’s racing. Catie and I started the day in B division. Nine very challenging races were completed in each division before the wind shut off completely. Despite the tough conditions that led to many ups and downs, the team was able to maintain its composure throughout the day thanks in large part to Coach Jack, who kept us mentally focused, and Cary and Meg, who kept us in good spirits and made sure we had enough water and food to keep us going. Going into Sunday, we were sitting in 15th place overall, though the points were very close among most of the teams. We left the marina content with our performance, but eager for what Sunday would bring. In honor of Coach Jack’s last dinner with the team, we went to his favorite restaurant – Outback Steakhouse. Thank you Mr. Swikart for that delicious treat! To keep Saturday’s routine consistent, the team was up early and once again one of the first teams at the venue. Just like the previous day, we were sent out to Crab Bank and waited in postponement for the easterly to fill in. Once it did, the race committee did not hesitate to start the first race. After five races in each division in similar conditions as Saturday, the Atlantic Coast Championships came to a close. Jack and Pati saw their results improve relative to Saturday as did Catie and I, though the team remained in 15th overall. 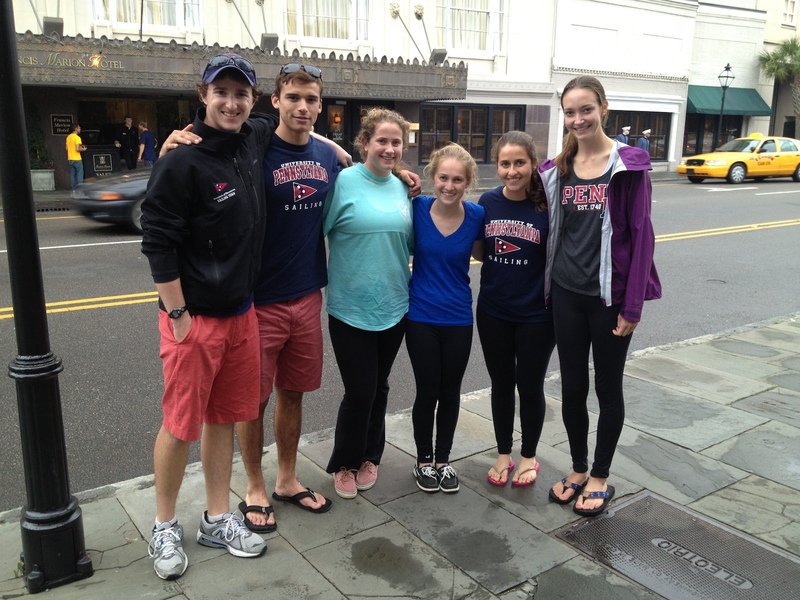 After leaving the marina, we headed to Charleston and walked around the historic town before beginning our long trek back to campus. Overall, we learned a lot at the event and showed that we can hold our own against the top teams in the country. We look forward to having a productive non-sailing season (there is no off season!) and getting back on the water in the spring to build on the strong year that we’ve had so far. Thank you to the Harding family for hosting us on Thursday night and again on Sunday night, allowing us to break up the ten hour drive into two segments. Also, thanks to those who travelled all the way to Charleston to support us! And, of course, thanks to Coach Jack for all the time that you have put into our team. We’ve come a long way and couldn’t have done it without you! This weekend, Jack Swikart, Meg Harding, Mac Agnese, Joe Farned, Cary Kane and I returned to Toms River Yacht Club for a chance at the MAISA club championship. We left school Friday afternoon and headed to the Swikarts’ house for some pizza and a good night’s sleep. 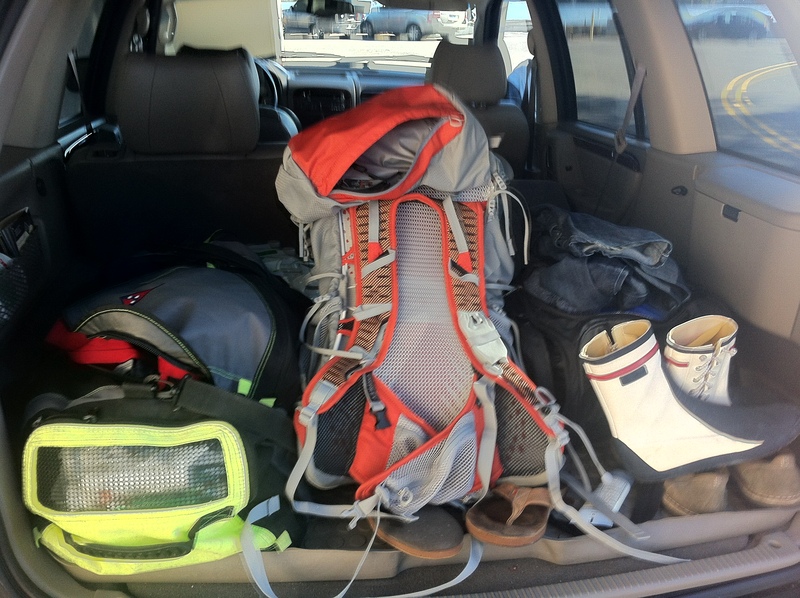 We woke up early Saturday morning to freezing temperatures and piled on lots of layers just to make the journey from the front door to the car. After some quick stops for food, we arrived at Toms River Yacht Club to frozen puddles of water on the Opti covers and rigged up our 420. Jack and I started the day in A division with two solid races, and Joe and Cary followed suit with a consistent set. Our day continued with us battling Fordham for the top spot. Meg switched in with Jack for their last set of the day, and they kept the consistency going strong. After a full day of racing, Joe and Cary headed in as the sun was setting on Toms River (it couldn’t beat our Essington sunsets though). Joe headed back to Penn with Coach Jack, and the rest of us headed back to the Swikarts to shower and get dressed up for fancy dinner. After some delicious steak and veggies, we watched some Louis C.K. and headed to bed after Jack picked Mac up from the train. Sunday morning was a little warmer than Saturday and a lot windier. We headed back to toms river ready to tackle the mounting breeze. Jack and Meg started the day with two more solid races, and Mac and Cary followed up with two firsts as boats began to capsize in B division. The wind quickly picked up from a manageable 16 knots to gusting 30 and the decision was made to call the regatta. After a successful weekend, we stood 7 points ahead of Fordham, making us the 2013 MAISA club champions. This past weekend, November 2nd and 3rd, marked the beginning of the “postseason” for fall sailing, meaning that from here on, it’s only qualifiers and championships until the end.  The first event on our itinerary was the War Memorial at Old Dominion University, located in Norfolk, Virginia. 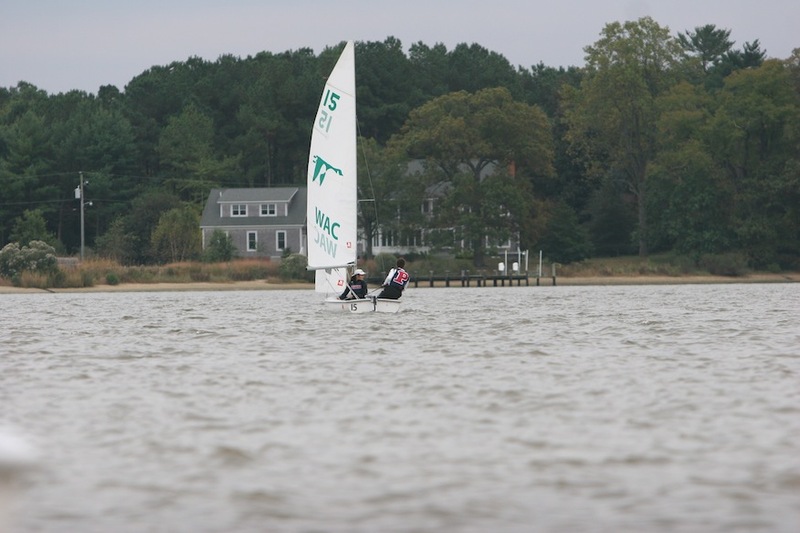 The regatta serves as the MAISA Fall Championship each year, as well as the qualifier for the Atlantic Coast Championship. This year, 8 teams from MAISA would qualify for a berth. A lot was on the line, but the team (composed of myself, Mac Agnese, Patricia Andrade, Catie Hopkins, Christina Atterbury and Foster Collins) was ready and up to the task. The first day of the regatta brought drizzly conditions with a light-to-medium Northerly breeze. Pati and I sailed in A Division while Mac and Catie started off the day in B. It was the first time this season that we were able to go up against all of the top teams in MAISA at once, but we came out with guns blazing and were leading the championship after the first set! The strong showing continued throughout the day as Pati and I sailed 6 consistent races in A Division, while Mac and Catie managed four top-6 finishes before racing was called for the day due to a lack of wind. Our combined races were good for third overall at the end of Saturday, though the scores were incredibly close throughout the top 10. After racing, the team enjoyed dinner at the No Frill Bar and Grill, one of Coach Jack’s favorite restaurants from his time as a student at ODU. The recommendation turned out to be well-founded, as the food was excellent and the portions generous. Once we got back to our hotel, we did a little studying before calling it a night. Sunday’s dawned with very breezy conditions of 20+ mph, just as the forecast had predicted. Mac started off the day with Christina, while I started with Foster. After 1 set, the conditions began to deviate from the forecast (which had called for a building breeze all day), with the breeze dying to a much more manageable 10-15. With that change, Pati and Catie went back in as crews for the remainder of the event. Neither Mac nor I was able to replicate our magic from the previous day, though we still managed to sail very consistently and easily maintain our spot in the top 8. At the end of the day, we ended up in 6th place, which was Penn‘s best finish in the War Memorial since 2007. It was also good enough to earn us a berth in the Atlantic Coast Championship for the second time in three years. I am very proud of the team at this point in the season and am really looking forward to the next two weeks. First we have MAISA Club Championships at Ocean County College (Toms River, NJ) and then of course ACC’s at College of Charleston. Stay tuned for updates each week as well as for our season-in-review once the season is wrapped up. See you on the water! 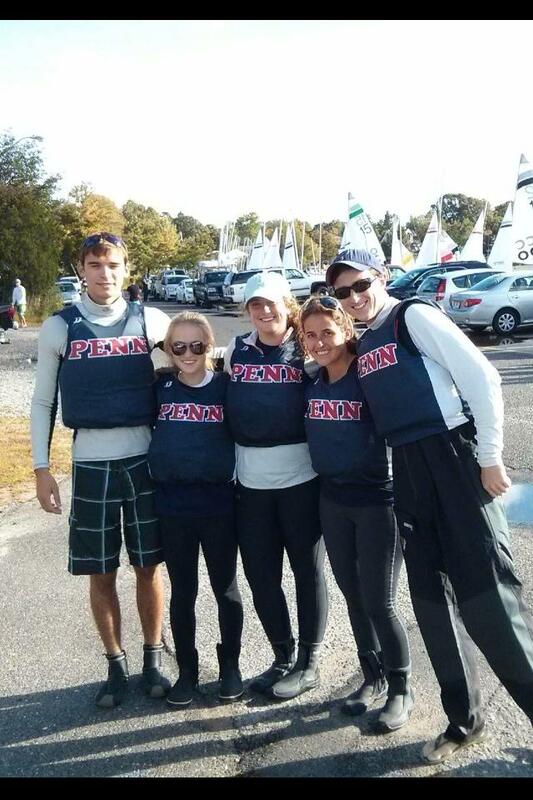 This past Friday, October 25th, Nate Pettit, Matthias Chia, Julia, Hurley, Christina Atterbury, and I caravanned westward for the Nittany Lion Open hosted by Penn State. After five and half hours of driving, we arrived at the Atterbury household in Johnston, PA. With open arms, we starving sailors embraced a feast of chicken and gravy replete with mashed potatoes, stuffing, spaghetti squash, and carrots (to stave off scurvy!). Full and thankful, we enjoyed playing board games and eating decadent homemade cookies before turning in for the night. In the morning, we awoke to sub-30 degree temperatures. After driving to Lake Glendale, we braced ourselves for a windy, wet, and cold day. The first A-division rotation brought breeze around 15 knots gusting to 20+ knots. In the first set, Christina and I finished 2nd and 1st in the ten boat fleet. The B-division rotation proved challenging for Matthias and Julia, who, after capsizing around the gybe mark and enjoying an extended swim in frigid water, were thankful to find dry clothes waiting onshore. The second A-division saw Nate Pettit skipper a 3rd place finish as I crewed for him. 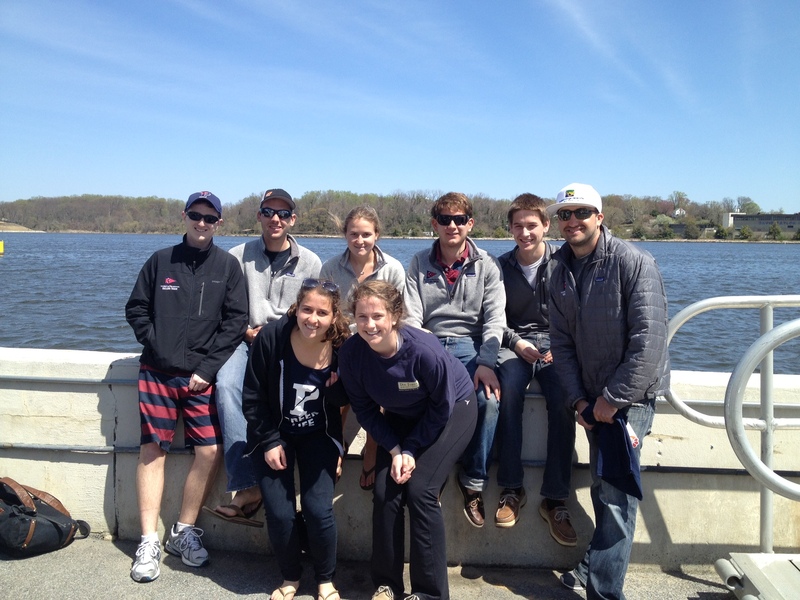 After completing the race, which saw five out of the ten boats sailing upright, Penn State ended the regatta early. A huge thank you goes to the Atterbury family for housing us; for preparing us dinner, breakfast, and lunch; and for making us feel welcome! 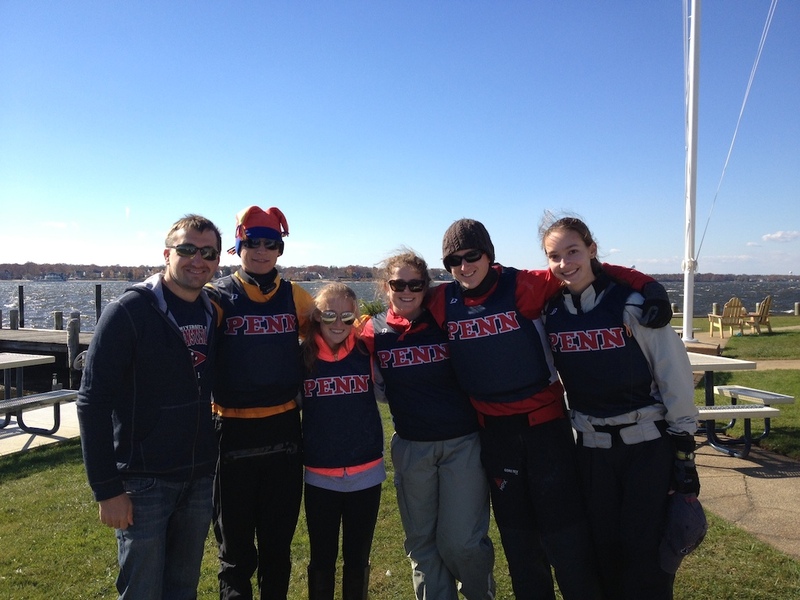 And, of course, thank you to the Penn sailors who, despite difficult and frustrating conditions, were among the few to say “no” when asked if they wanted to call the regatta! 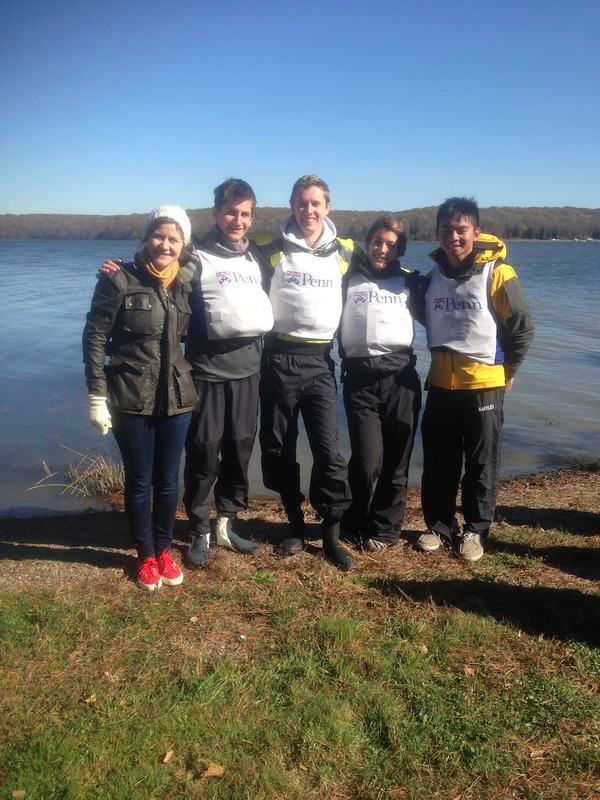 This past weekend, Maxwell Ryder, Steven Ho, Joe Farned, and I drove down to Chestertown Maryland for the Central Fall #2 regatta, hosted by Washington College. While most competing teams hailed from Maryland or Virginia, Philadelphia was well represented at the event, with teams from Drexel, Villanova, and Penn. We arrived to the event a bit later than Coach Jack desired, but the first races ended up being delayed, as we waited for the wind to settle into the bay. Joe and I, having never sailed together before, used the time to practice a few tacks. After 11, we set out for the first race. The wind was shifty, and the current was strong, but we sailed a few good races. As a new sailor, this was a great opportunity for me to learn a lot. With a lot of help from Joe and Coach Jack, I left day 1 feeling much more confident and knowledgeable. Steven and Max, although described as sailing a ‘very heavy boat,’ did equally well. We concluded day 1 in 11th place with high hopes for the next day. After some Mexican food and a few rounds of virtual training on SailX, we all hit the sack. Day 2 brought pleasant weather and overall lighter, but still shifty, winds. We were able to begin racing much sooner. Both teams performed more consistently on the second day, and we were able to finish in 8th place. Overall, it was great weekend, and I am thankful that I could take part. 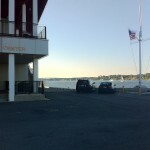 The story of last weekend’s regatta actually begins on Thursday night when Jack Swikart emailed Pati Andrade, Mac Agnese, Catie Hopkins, and myself saying that we could no longer attend the Captain Hurst Bowl at Dartmouth as we had intended because there had been a mistake in the scheduling. 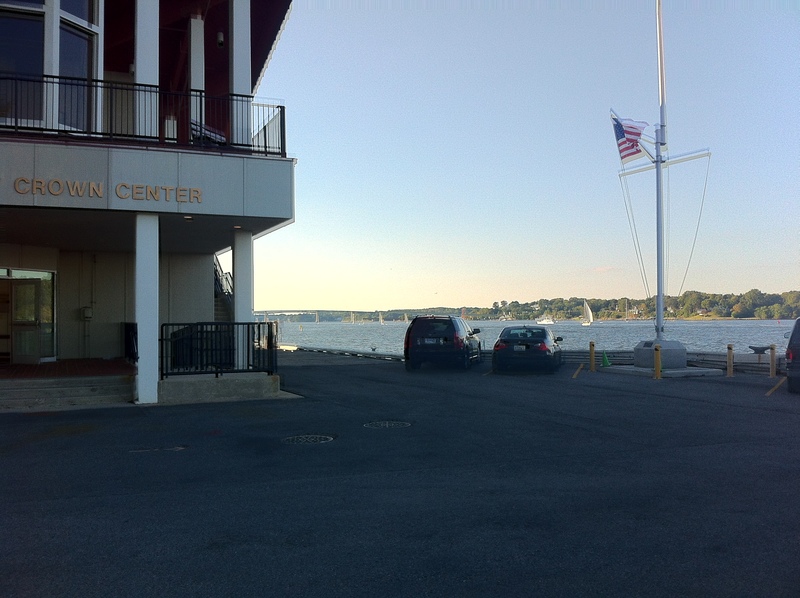 Instead, Jack arranged for us to compete in the North Fall 2 Regatta hosted by SUNY Maritime College in NY. On our way to the Swikarts’ home in New Jersey on Friday, we celebrated our shortened car drive by stopping at a New Jersey movie theater to see the recently released (and very intense) Captain Phillips. After a quick dinner at a Chili’s restaurant we arrived at Swikarts and headed to bed. After fighting through miles of traffic the next morning, we finally arrived at SUNY, only to find very light wind conditions. A Fleet was sent out in an attempt to start the regatta, but the RC soon called the sailors in again without getting off a race. We proceeded to wait out a 2-hour wind delay in the chilly fall air before the wind finally filled in from the South East to a light breeze. Pati and Jack started us off in A division with a solid first set getting two 3rds. Mac and Catie followed suit winning two 3rds of their own, the beginning of a very consistent day. The afternoon continued, with A team getting in a total of six races, while B team only fit in four. The day ended with Penn in 2nd place. After returning to the Swikart’s house and enjoying some delicious soul food, the team headed to bed. Sunday dawned a little colder and a little windier than Saturday, with the breeze moving from 8 to 12 knots throughout the day. We arrived at SUNY early and quickly rigged before sending Mac and Catie out to start us off with a 1st and 3rd. Jack and I then took to the water, before Catie and Mac went out again. The colder breeze continued to pick up, and the tide completely changed direction for the last few races (at on point dragging the gate buoys with it). 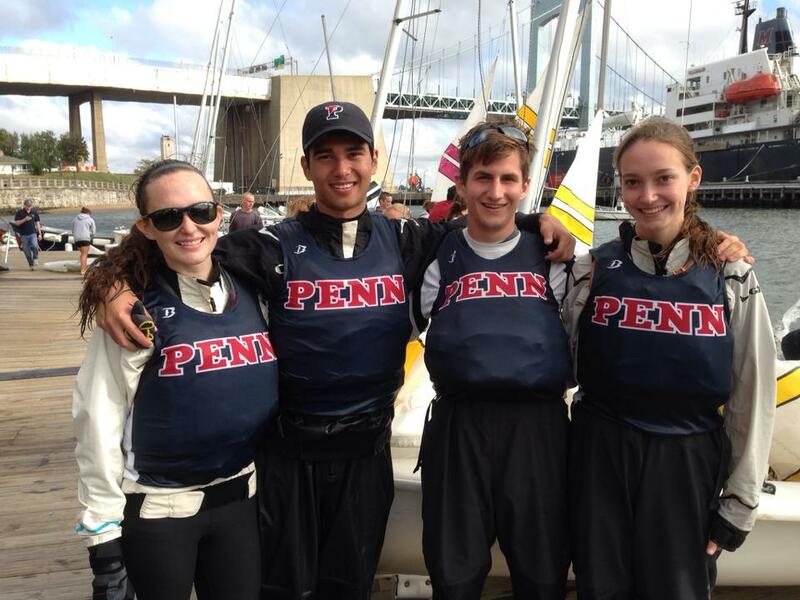 Despite these added difficulties, Penn continued to sail well, finishing the regatta in 3rd place with 99 points, 6 points behind the 2nd place team. The team then packed up and headed back to campus – enjoying a fantastic birthday cookie-cake on the way. A huge thank you goes out to the Swikart family who not only graciously hosted us on incredibly short notice, but did so when they already had a high school sailing team staying at their home as well. We really appreciated their warm hospitality. Last weekend, Jack Swikart, Mac Agnese, Pati Andrade, Catie Hopkins and myself travelled to St. Mary’s for the SMC Fall Intersectional. 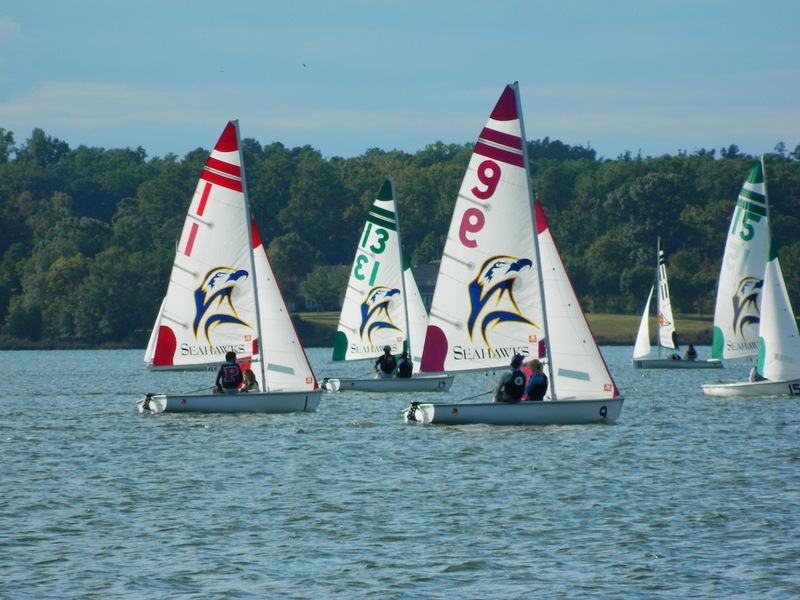 Eighteen teams participated from all different conferences, many schools travelling several hours to attend this regatta. We knew this was going to be a tough one, but we went to bed at the La Quinta Hotel on Friday night feeling positive and ready. We woke up Saturday morning excited for the day of sailing ahead. We were the first team to arrive at the St. Mary’s boathouse, and we took advantage of this time by getting into the competitive mindset and making sure we were all ready for the coming races. Mac and Catie started off in B Division in 420’s while Jack and Pati began the day doing what they do best: A Division FJ’s. It immediately became clear that conditions were tough, the northwesterly breeze coming off the land made finicky puffs and hard-to-predict shifts the name of the game. Despite these hardships, Mac and Jack made the best of it and finished out Friday in ninth place. We ended the day feeling good about having broken the top ten and celebrated with a Bloomin’ Onion at Outback Steakhouse. The next morning, we felt ready for the six races left in the regatta. Sunday was a bit more difficult, however, the breeze was as tough as ever and a couple of races didn’t go our way. We ended up in twelfth overall and headed back to Philadelphia knowing we had seen tough competition. We were, however, excited to continue our hard work and feel very good going into the next few weekends. 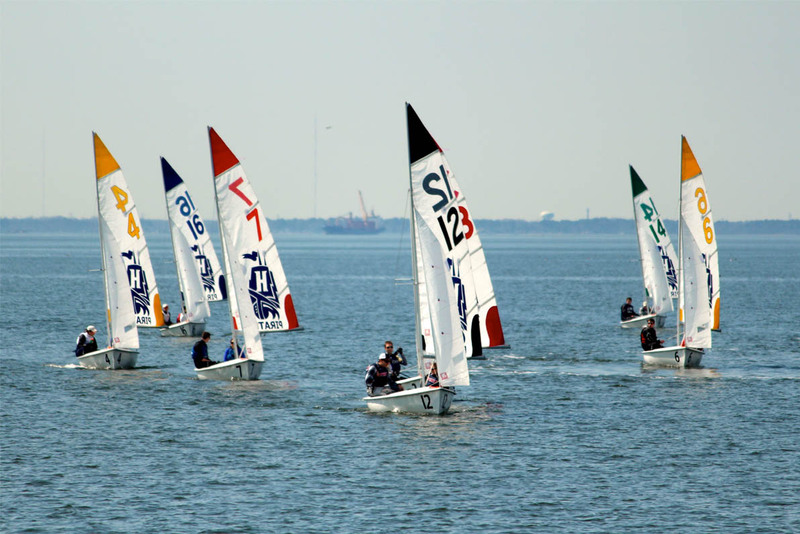 This weekend Jack Swikart, Pati Andrade, Mac Agnese, Meg Harding and I headed to Toms River, New Jersey for our first big regatta of the season. Friday night we feasted on a home-cooked meal with the other half of the team, and then headed back to the Swikart’s house to get some rest knowing we’d have an early start on Saturday. After leaving the Swikart’s at 7:30 with some quick food pitstops along the way, we arrived at Toms River Yacht Club to cloudy skies and a massive white tent being pitched on the lawn. We rigged our boats, Jack and Pati had the dreaded Tech in A division, while Mac and I had the 420 for B. After it poured for a minute, the sun came out for the rest of the day. Starting in some fairly light breeze, we set the standard for the day early, showing consistency in each race, even as the breeze started to pick up. Mac and I started with a string of firsts, and Jack and Pati started with a 4th which would be their worst finish of the day. After three sets in winds that had gotten up to 14-18, Meg and I switched off in the 420s. After a few challenges in their first race, Meg and Mac continued to dominate the B fleet, as Jack and Pati kept cleaning up in A. With no lunch break and strong winds, it wasn’t long before we reached the halfway point of the regatta. After nine races, Jack switched into the 420 and Mac into the Tech to finish off the day. They both continued to extend our lead in the standings, finishing the day consistent with how it had started. With the wedding impending, we were off the water by 3:30 with a commanding 48 point lead in the standings. As a reward for a great day we took a detour to see the boardwalk in Seaside Heights, and then headed back to the Swikart’s to eat with the rest of the team and compare stories and bruises from the day. Sunday morning we packed up and headed out to finish off the last six races. The wind, despite sunny skies, was blowing hard even early in the morning. Meg and Jack started off again in the 420s while Pati and Mac prepared to finish off in the Tech. After both pairs struggled a little bit with consistency in a breeze that topped out around 22 knots, they both finished with solid last races that confirmed our lead over St. Mary’s. 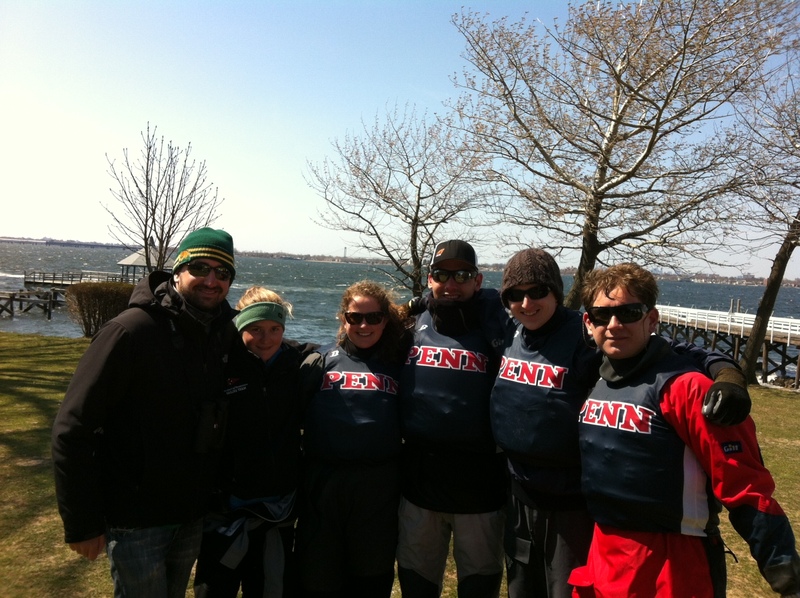 After the world’s longest search for a sail bag, we headed back to Penn, my first college regatta under my belt. Thanks to OCC and Toms River for hosting the regatta. Also, big thanks to the Garths for feeding us on Friday, and the Swikarts for being such great hosts all weekend. This weekend (September 21-22), Max Ryder, Cary Kane, Caroline Garth, and I headed north to not-so-SUNY Maritime to compete in our first double-handed event of the year. After a veritable feast of lasagna and cupcakes, we spent a restful Friday night an at the Garth’s house in New Jersey. The next morning, we awoke at 6:30am, went to Grandma’s Bagel’s (which gave Naval Bagels a run for its money), and drove an hour to the Bronx. After a one hour wind delay, the forecasted southeasterly breeze and storm system began to fill. The first set was completed in 5-7 knots. In A division, Cary and I led the pack consistently on the upwinds. After some difficult downwinds, however, we posted 3rd and 4th place finishes. Caroline Garth (New Jersey State Champion) and Max also came off the line well, posting a 2nd and a 7th for their first set. The wind built progressively — much to our frustration as one of the lighter teams — peaking at 16-22 knots for the last rotation. At the end of the day we won a protest in A division against Columbia and finished out Saturday in 5th place overall. After dining with the rest of the team at the Swikart’s house and staying another night at the Garth’s, we returned to SUNY on Sunday. We sailed six races in both A and B fleets, handling breeze up to 24 knots. In terms of results, Sunday proved more challenging, and we posted a number of midfleet finishes. Towards the end of the day, we sat next to Cornell in the standings. In perhaps the greatest alliterative showdown in the history of Penn sailing, Caroline challenged Cornell in the last two B division races. Despite a fantastic set, we lost out by only 9 points. 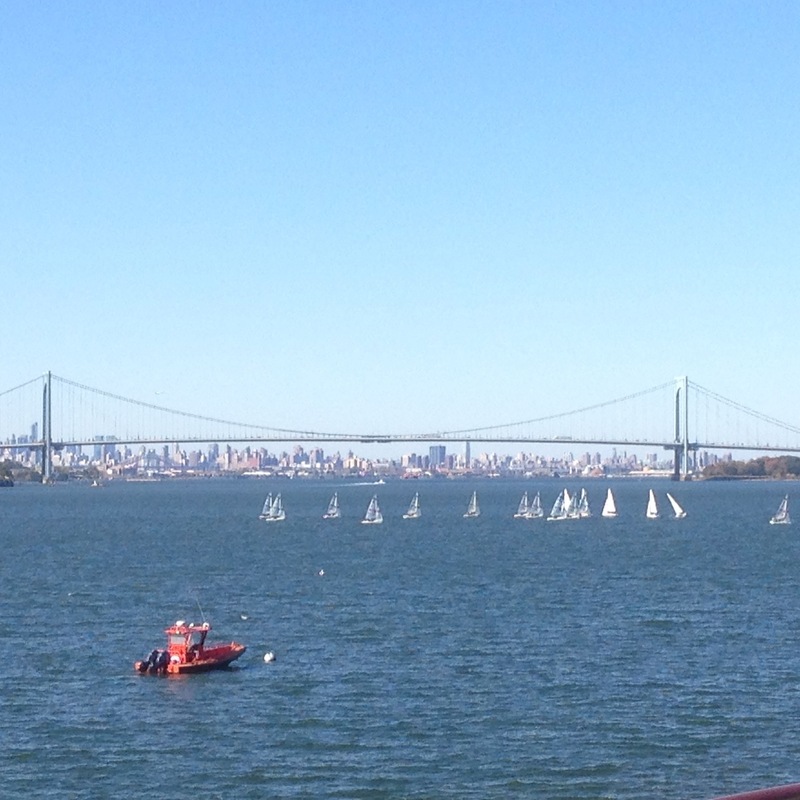 Thanks to the Maritime sailors for running twelve races in tricky race management conditions on the East River. Also, a huge thank you goes out to the Garth family, who hosted us for the weekend, and Mr. Garth who drove us to SUNY and back. Also, we are extremely grateful to Mr. Swikart, who drove us from Penn to New Jersey on Friday, and from New Jersey to Penn on Sunday! This weekend (September 14-15), Jack Swikart and I headed south to Navy for Laser South for the first regatta of the fall season. After a restful Friday night at the Harding’s house in Annapolis, we woke up at 7:30am, got cheesy at Naval Bagels, and were on the docks rigging our Lasers by 9am. Quick to launch, the 20 full rig sailors were out on the water thirty minutes later splitting tacks and watching for puffs in the light conditions. Jack was able to get off the line cleanly for the first set of two races, while I struggled to accelerate despite setting up with wide holes below. Strategically, it was key to simply connect the few puffs and position ourselves for the shift, phasing right and left every two or three minutes. Jack’s 5th and 6th finishes put him towards the top of the results. As the breeze picked up, the lefties began to roll through. For the next six races, everybody immediately tacked to port after the gun, so competition for the pin end was fierce. For the majority of these races, Jack and I posted midfleet finishes. At the end of the day, the breeze went right, which added to our frustration over the unpredictable conditions. After seven and half hours of sailing, we came in at 5pm. There was expected to no to little breeze on the second day. The first two races were canceled, unfortunately, considering that Jack and I rounded in the top 5 for each for lack of breeze. However, the race committee opted to move the fleet out of the Severn into the Chesapeake where we sailed 6 more races in breezy and wavy conditions to complete a series of 18 races. A huge thank you goes out to the Harding family, who not only housed us and made us feel welcome, but also surprised with us lunches and snacks. Also, Jack was very kind to volunteer his car and time for the trip South. And, of course, we are grateful for the help of our coach Jack Kerr, who helped guide us through the tricky conditions. This weekend Jack Swikart, Patty Andrade, Meaghan Harding, Christina Johns, Jose-Maria Barrero, and I traveled to the U.S. 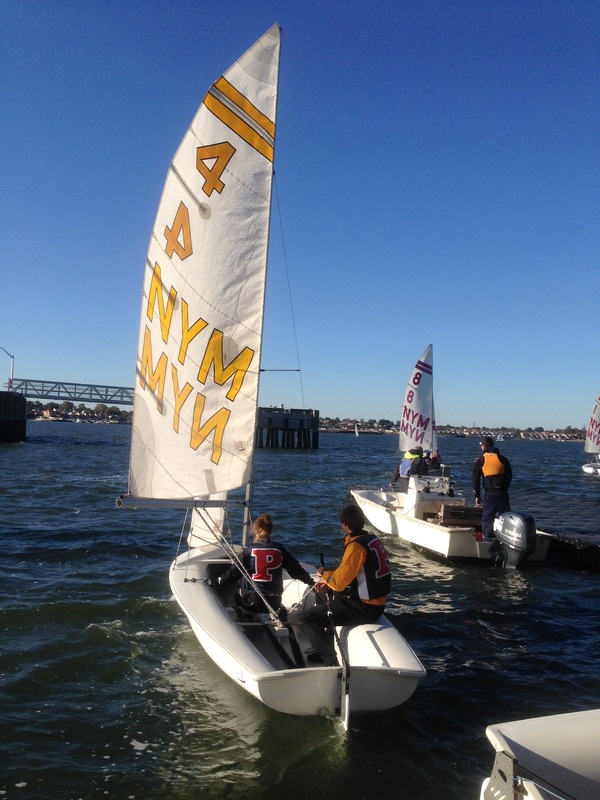 Naval Academy to sail the 2013 MAISA America Trophy. With a forecast for big breeze, FJ expert, Foster Collins, also joined us in our quest to finish in the top 8 and qualify for the national semi finals to be held in Hampton, VA in two weeks. Unfortunately, the tricky mid-April conditions proved challenging for our team; both Jack and I struggled with the strong MAISA fleet resulting in an 11th place finish ending our hopes at post-season competition. On Saturday, after short on-shore delay, we began sailing in the Severn River in a shifty 5-10 knots. I started in the FJ sailing with Christina in A division and Jack sailed B with Meg and Patty splitting time in the front of the 420. 6 races were run before we broke for lunch. The highlight of the morning was Jack’s 2nd in race 4B. In the afternoon, the breeze shifted far left forcing PRO Gavin O’Hare to move the course out to Annapolis Harbor just off of Triton Point. As a team, we finished consistently around 12th as the breeze built in the afternoon. After race 9 we switched fleets. I sailed races 10, 11, and 12 in a 420 with Jose and Jack finished the day with Patty in an FJ. In total, 12 races were completed on Saturday. With 6 races scheduled for Sunday we returned to the Robert Crown Jr. Sailing Center without any intention to let up. Jack and Patty sailed extremely well in B division with 5 top 10 finishes. In A division, Christina and I worked hard to improve on Saturday’s results. In race 15A we got off the line clean and sailed to a 4th place finish. Jose jumped in the boat as the breeze built in race 16. By noon we were sailing back to the dock with 18 races completed. We finished 11th overall falling slightly short of our goal. All in all it was a wonderful weekend spent at Navy. A huge thank you goes out to the Harding family who hosted us for the second time this season. Also, Foster was extremely helpful on land ensuring that our sailors had a hand on the dock. As always, our coach, Jack Kerr, provided grounded advice and helped us work through the tricky conditions. As seniors, Jose, Christina and I tried to keep the mood light and enjoy our final regatta as much as possible. While it would have been nice to make it to Hampton, VA for semis, I speak for Jose and Christina when I say we have nothing to regret. While we originally joined to develop and compete, the level of friendship and camaraderie gained over the past 4 years is something to reflect on fondly. Stay tuned as our younger sailors travel to Georgetown and Delaware University next weekend to round out the Spring Season. 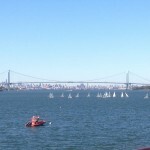 This weekend Mike, Jack, Christina, José and I travelled to Fordham and Columbia for the Greater New York Dinghy regatta. After staying at the Swikart’s house Friday night, we got up early Saturday morning to make the trek to the Morris Yacht and Beach Club at Fordham and Columbia. Friday morning was beautiful with sunshine and good breeze. Both Mike and Christina in A and Jack and I in B had great opening sets. The wind, however, continued to die throughout the day, completely switching directions at around two o’clock. Due to the light conditions, we were unable to finish the last set but by that point, the light wind had frustrated everyone long enough and we were ready to call it a day. We rounded out day one in third overall, hoping that all of our practice in the heavier conditions predicted for Sunday would be enough to propel us further in the standings. We woke up Sunday feeling good about the day ahead. B Division set out first to finish the third set, hammering out two good races in third and first. José hopped in to crew for A division as the wind picked up and he and Mike had an awesome race, finishing in first. Unfortunately, by that point the wind had picked up so much that conditions were no longer ideal and the regatta was called at one p.m. after a ninety-minute wind delay. We ended Sunday in second place and feel great going into next weekend. America’s Trophy here we come! Big thanks to the Swikarts for hosting us Friday night. This weekend, Mike Russom, Jack Swikart, Christina Johns, Jose Maria Barrero, Sherlyn Chen, and I traveled to Hampton, VA for the Maisa South Qualifiers. We ended the regatta victoriously after two days of racing against other 15 teams. In total each division sailed 11 races. Mike and Christina sailed A-division and Jack and I sailed B. Both divisions sailed in FJs, and because there was only one fleet, we alternated after every set. Mike and Christina started off the regatta on Saturday at around 10:15 given that the wind was very light, but even in these conditions they sailed a great set, heading us into a great start. Jack and I sailed the next set and also were in the top three in both races. As the day went on, the wind picked up a little and continuously changed direction. We finished the day in second place after each division had sailed 3 sets. On Sunday the sunny weather from the day before was replaced by rain and slightly stronger wind. As soon as we arrived in Hampton, we were informed that there had to be a redress for Race 5A (which Mike and Christina had won). Gladly, the race took place again and they were first once more. After 3 great races, Jack and I went back in the water and finished our set in the top 3. The day went really well for both divisions. By the end of the day, after all the protests were taken into consideration, our victory was announced. GO QUAKERS! 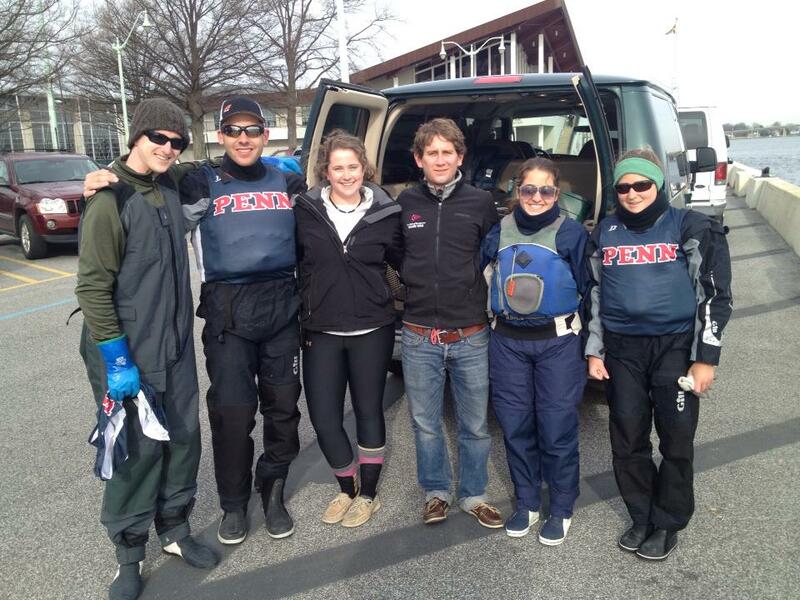 This past weekend, Mike Russom, Jack Swikart, Patty Andrade, Meaghan Harding, Jose-Maria Barrero and I traveled to Annapolis, MD to compete for the Ivy League Championship hosted by the US Naval Academy. We were one of nineteen teams competing for the Owen, Mosbacher and Knapp Trophies, and finished 4th among the Ivy League teams and 8th overall. On Saturday, we began racing in the Severn River in 10-12 knots, which built to the high teens over the course of the day. Mike and I started off in A division, with Jose stepping in as the wind increased, and Jack, Patty, and Meg sailed well in B division. We sailed 12 races in each division by the end of the day, and ended up within 20 points of the top three teams. Sunday brought slightly different conditions. We arrived at the Academy to calm and chilly weather, and Mike and I headed out in A division with Jack and Patty in B division. We sailed one race on the river before the wind died and racing moved out to Annapolis Harbor for some more consistent breeze. 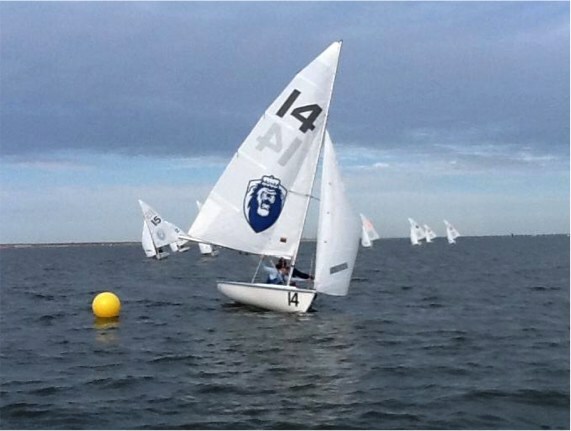 Five more races per division were held in light and shifty conditions, making for challenging sailing! Racing was called for the day after 18 races had been completed, and Penn ended up eighth. 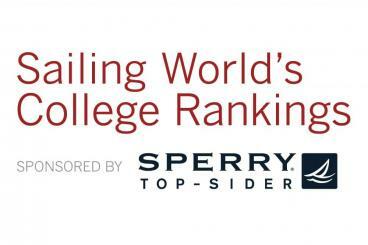 Full results can be found here: http://scores.collegesailing.org/s13/owen-mosbacher-knapp-trophies/. A huge thanks to the Harding family for their hospitality in hosting us this weekend!